Now the Advocacy workshop is over, I am concentrating on the mid-term evaluation of our Global Midwifery Twinning Project. This has taken me out of Kampala, past the Equator, to visit midwives up-country where our GMTP volunteer midwives have been based, learning about Ugandan midwifery, providing training in Emergency Obstetric and Newborn Care and role-modelling woman-centred care. Yesterday we visited three private midwives clinics all providing community-based midwifery services, many in remote areas currently in poverty until the rains come. All of these small centres are providing 'gold-standard' midwifery care with continuity, privacy, cleanliness, good clinical standards and geographical accessibility. However, they are often under-utilised for maternity services as women have to pay. Instead, women stay at home to deliver with a Traditional Birth Attendant, or use the government health posts which are under-resourced and under-staffed. We visited one such government district hospital; the one doctor was overwhelmed with patients and had no time to examine them or provide proper diagnosis and treatment. As we toured the wards, an old man died in the corner died without ceremony from pneumonia. He was peripherally shut-down and staff couldn't find a vein to start the IV antibiotics he desperately needed. There was no oxygen and no nurse by his bedside. In the out-patients' department a baby, no more than 4 months old, was breathing too fast with a chest infection. He should have been admitted for intensive nursing; instead he saw the doctor for 30 seconds and was sent away. The maternity unit was quiet as the operating theatre was temporarily closed for building works. Women are referred there for caesarean section, only to be referred onto another place. One of our volunteers had donated some beds for the hospital and conducted some training for the midwives there. However, maternal mortality rates in Uganda are still rising. Political will, cultural issues and system transformation are required for sustainable change. Today I attended a workshop with the Ugandan Nurses and Midwives Council, reviewing the final draft of their new midwifery handbook. I my presentation this afternoon I urged midwives to join together in lobbying the government to introduce free midwifery care for women at any centre with skilled birth attendants and appropriate equipment. The private midwives have so much to offer. A voucher scheme entitling women to free services would enable many more women to benefit from this gold-standard care - and save lives. Financial incentives such as these have contributed to a drastic reduction in the maternal mortality rates in Nepal and Cambodia (our other twin countries) in recent years. I have mentioned before that Ugandan Midwives are very spiritually minded - we had four prayers today at the workshop (I am trying to imagine an NMC workshop in the UK with prayer before each coffee break...!). I decided to go with the flow and end my presentation using some words from the Bible, exhorting midwives in Uganda to work together, to be strong and courageous and not to give up. 'Be strong and very courageous as you lead these people.. that you may have success. Do not be afraid or discouraged, for the LORD your God will be with you wherever you go'. "We are together again, in one accord. Something good is going to happen, something good is in store". So our workshop finished yesterday with the sound of singing. There is nothing quite like African voices raising the roof and the song was our GMTP anthem, developed originally for the RCM staff conference back in July. It’s a round in three parts with words about the need for more midwives across the world (written with help from my creative husband), set to a hymn tune I first learned from American Mennonites in Cambodia! 1. Worldwide midwives far too few, ­­ worldwide midwives far too few. 3. Education, regulation and association. Follow this link to listen to a recording http://www.youtube.com/watch?v=W1LD-gOlrpU. ‘If you want to go fast, go alone. If you want to go far, go together’. “I will never give up until things are done. One of the key advocacy messages highlighted at the workshop was the need for more male involvement around reproductive health in Uganda. Robina, National Coordinator for the White Ribbon Alliance in Uganda reminded us that women are dying because society has not decided that their lives are worth saving. The workshop helped UPMA to develop a clear action plan to target local community leaders, developing ‘model districts’ where men value women’s reproductive health rights and ensure that barriers preventing access to good quality services are broken down. Sarah, a midwife and politician, ended the conference with the inspiring thought that one life saved has huge impact. Another African proverb: ‘sticks collected one by one make a bundle’. The challenge for UPMA, and the Global Midwifery Twinning Project, is to ensure that the energy and momentum generated by the workshop will be continued for the next 18 months and beyond. Putting firm plans in place for this will be the focus of my remaining time in Uganda. It’s been a great day but I feel like I’ve been run over by a bus. So much has been happening, so many people have been coming and going and there has been so much information to take in. Bertha is doing a great job and is working everyone really hard! Today was all about refining the problems facing midwifery in Uganda and identifying (a) what is feasible to address with an advocacy strategy and (b) what is outside the remit of a professional association. Some concepts were shelved as it became apparent they were being addressed by others or were too complex for this organisation at this stage. Others, were subjected to fierce critical analysis and came out completely changed! I personally have learned much about the theory of advocacy and how to facilitate learning about it - I know this will be really useful for the life of the project and beyond. Bertha has a ‘bag of tricks’ that keeps the conversation lively and different people are appointed each day as timekeeper, energiser and spiritual leader. The prayer times before, during and after proceedings are a defining feature of any UPMA gathering. It is not a religious organisation, and the midwives come from all different faiths and denominations, but prayer is recognised as essential to progress – perhaps there is a lesson here for midwifery in the UK! Some really important people attended today from the Uganda Nurses and Midwives Council, the big state university (Makarere) in Kampala, the White Ribbon Alliance, newspaper correspondent and Mildmay Uganda – as well as some additional midwives from UPMA who couldn’t be with us yesterday. At times I joined in the discussion; other times I observed the interaction between participants or acted as photographer. It was great to see everyone participating and working well together; the president, the CEO and all the executive committee were completely engaged in the process and were helping to facilitate their groups, thus developing their leadership skills. Sometimes they were shouted down – democracy is alive and well in the UPMA! The UPMA president stating her case! I am trying to pace myself, aware that this is only the beginning of a 12 day trip. After the workshop I still have much work to do, interviewing many people for the project evaluation and making up-country visits. I am looking forward to a day off on Sunday. Meanwhile, there is limited internet but I will try to blog and Facebook when I can and keep you all updated. Njakkulaba enkya – see you tomorrow! 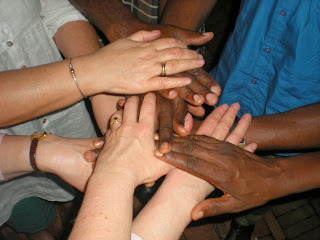 I’m in Uganda for 12 days with the Global Midwifery Twinning Project. It’s my second time here – what a joy to meet these midwives again, and those who are working alongside them. This time I knew the face meeting me at the airport, Bonne, UPMA’s driver. I was carrying a very special parcel for him, a set of binoculars from my colleagues Helen and Breedagh who came to Uganda with me in April. Bonne had taken them to the Botanical Gardens where they looked at the birds through Helen’s binoculars. Bonne was amazed – and now he has his own pair. He was overjoyed with his present and I was happy to have carried it for him from the UK. My suitcase was mostly filled with midwifery teaching materials. I also carried an extra suitcase for another charity that had to be collected at Heathrow. This was arranged by e mails via Malaysia, France and Leamington Spa… happily all made it through customs without incident. Note to self: must travel lighter! It’s over an hour’s drive from Entebbe airport to the Hotel in Kampala (Kampala doesn’t have its own airport). It’s nice being back in the same hotel – the staff are so friendly and though the rooms are simple the place is clean and the food is tasty and plentiful. The workshop is here too which makes the mornings simple! Day one was hectic, meeting the Commissioner/Chief Nurse at the Ministry of Health as I had barely stepped off the plane. I then spent some time with the consultant leading the workshop, as we’ve only ever met by Skype. She’s from Bolivia and is a world expert on developing Advocacy Strategies with midwifery associations. She’s doing a great job, and I’m enjoying her company too. We had a pre-workshop meeting later that afternoon with UPMA, understanding everyone’s expectations of the workshop. We carried on working through the evening, planning the rest of my time here. Today we started our workshop and had participation not just from UPMA (Uganda Private Midwives Association) but also from parliamentarians, Ministry of Health, Universities, NGOs, UN agencies and others. I gave a small speech about our project, and showed some photographs from the other countries. Bertha (our consultant) helped us to understand what Advocacy is and is not, and what steps are involved. This afternoon the participants identified potential issues around which a midwifery advocacy strategy could be developed and did some analysis of these. One group wants an advocacy campaign to train male midwives – that led to an interesting debate! Bertha and I hired a driver (Wilson) this evening and went to the Kibera Country Club (very posh!) to meet Michele Ball, a British Midwife and RCM member working in Uganda who helped us access hospitals on our last visit which was hugely appreciated. It was great to catch up with Michele and have a change of scene. Internet is very intermittent at the hotel and I can’t post this now (or Facetime my family L) but hopefully I can post at breakfast time and add some photos from the past 2 days. Night night! Volunteering is the 'in-thing' right now. David Cameron is promoting 'The Big Society', supposedly unleashing the social energy that exists in the UK to help build a better, healthier society. Closer to home, my daughter is undertaking The Duke of Edinburgh Award and must volunteer in the community every week for three months to qualify for the award. My good friend and walking buddy Anita runs' My Ten Days' encouraging and supporting owners and managers of small to medium size enterprises (SMEs) to give one employee ten days paid leave to do voluntary work or fund raising (http://www.mytendays.org/what-is-my-ten-days-_48/). Yesterday I discovered my hairdresser Heather has just returned from 4 weeks volunteering in a school in Uganda - I leave for my second trip to Uganda tomorrow so you can imagine we had a lot to talk about. Volunteering aims to benefit society. The Royal College of Midwives' Global Midwifery Twinning Project aims to help reduce maternal and neonatal mortality in Nepal, Cambodia and Uganda by strengthening the capacity of the professional midwifery assocations in those three countries. Our UK midwife volunteers spend up to 4 weeks in-country, helping develop midwifery education, regulation and practice (http://www.rcm.org.uk/college/policy-practice/international/twinning/). However, volunteering also aims to benefit the volunteer - personally and in their work. The World Volunteer Website suggests that volunteering not only has a positive impact on the community but benefits to volunteer, developing their skills, giving motivation and a sense of achievement, boosting career options, opens up new interests, hobbies and experiences, allows the volunteer to meet a wide range of people and sends a positive signal to employers, teachers, friends and family (http://www.worldvolunteerweb.org/resources/how-to-guides/volunteer/doc/benefits-of-volunteering.html). A recent systematic review in the journal Globalization and Health (Jones et al, 2013) showed that, despite limitations in the quality of evidence, there is a strong theoretical argument that the skills acquired through volunteering are transferable to service delivery within the NHS and that the benefits to individuals and institutions could be maximised when volunteering is formally embedded within continuing professional development processes.